Fifteen science, technology, engineering and mathematics (STEM) professionals have a chance at recareering as secondary classroom teachers through Rio Salado’s Noyce Scholars Program. Qualified candidates will benefit from a generous $16.5K stipend provided by the National Science Foundation (NSF) and Rio Salado’s fast-track teacher education program. The next deadline to apply is July 24, 2015. Westersund completed a student teaching assignment at Tempe Union High School in November and received her teacher certification in January. She plans to teach honors algebra and financial algebra at Horizon Community of Learning Charter School in Phoenix. 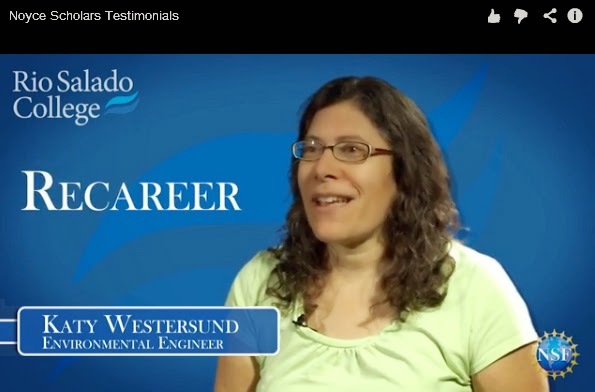 Westersund is one of 28 Rio Salado students who has already completed the program. The 15-month post-baccalaureate program is online, making it accessible and convenient. “Students are supported throughout the program with their coursework by a success coach and a mentor during the first year of teaching to assist with classroom management and other first-year teacher challenges,” said Noyce Scholars Program Manager Karen Nave. Candidates must have a bachelor’s degree, three or more years of experience in a non-education STEM career-- and a passion for teaching. The application process includes a subject knowledge exam, a teaching seminar and screening interview. Please note, the application process usually takes about a month to complete. Classes for the next cohort begin the first week of September. For more details, visit www.riosalado.edu/noyce or call 480-517-8066.